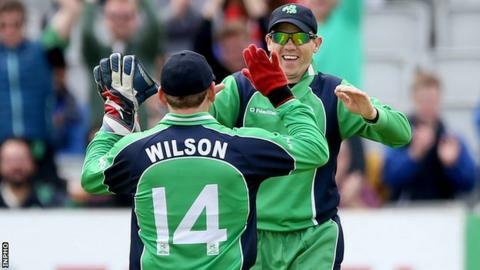 Ireland lost by 79 runs to Sri Lanka in the first of this week's two one-day matches between the sides in Dublin. The hosts had their opponents 95-5 and 176-8 but the momentum swung as Mendis and Nuwan Kulasekara hit 43 from the final 22 balls as Sri Lanka made 219-8. Ireland were 5-2 but a 58 partnership between William Porterfield and Niall O'Brien gave their side hope, skipper Porterfield top-scoring with 37. Ajantha Mendis took 3-26 from his 10 overs to help bowl out Ireland for 140. Kusal Perera fell to the fourth ball of the match at Clontarf and Lahiru Thirimanne (8) edged Alex Cusack to wicketkeeper Gary Wilson. Stuart Thompson had Upul Tharanga (24) nicking to Wilson, making it 57 for three, and Dinesh Chandimal's innings of 39 was brilliantly ended by Kevin O'Brien's catch off his own bowling. Paul Stirling then struck with his second ball, Kithuruwan Vithanage edging to Ed Joyce at slip, before Sri Lanka's hundred came up, five down, from the last ball of the 31st over. The key wicket of Angelo Mathews (30) came via a direct hit from Niall O'Brien but new man Kulasekara quickly lifted Cusack for a straight six. Ashan Priyanjan made 31 from 44 balls, with four boundaries, before chipping Dockrell to Joyce at mid-on and Tim Murtagh (2-21) removed Sachithra Senanayake for three. But Dockrell haemorrhaged 17 runs in the 48th over including three successive boundaries for Mendis, who finished 18 not out from only nine balls with Kulasekara 42 not out from 34. Ireland started badly as Stirling edged Kulasekara for four but was bowled next ball and the in-form Joyce failed to trouble the scorers, edging Suranga Lakmal to keeper Chandimal. Porterfield and Niall O'Brien produced a handful of boundaries in their stand of 58 before the latter fell lbw to Mendis for 33. Wilson (three) was shambolically run out before Kevin O'Brien holed out first ball off Lakmal, and when Thompson was trapped on the crease by Mendis, Ireland were 74-6. Their last hope went when Porterfield (37) hoisted Mendis to Perera at deep square leg, while Cusack made 10 before being yorked by Lakmal (3-29). Max Sorensen (17) was dismissed from the first ball after drinks and although Dockrell (18 not out) and Murtagh (10) at least went down fighting, the Middlesex paceman was trapped lbw by Senanayake after hitting two boundaries to end proceedings.